RPF Recruitment board is about to release new 9500 RPF vacancy for the year of 2018. This RPF Recruitment 2018 notification is regarding to enroll 9500 RPF vacancy that will be update very soon from railway ministry. 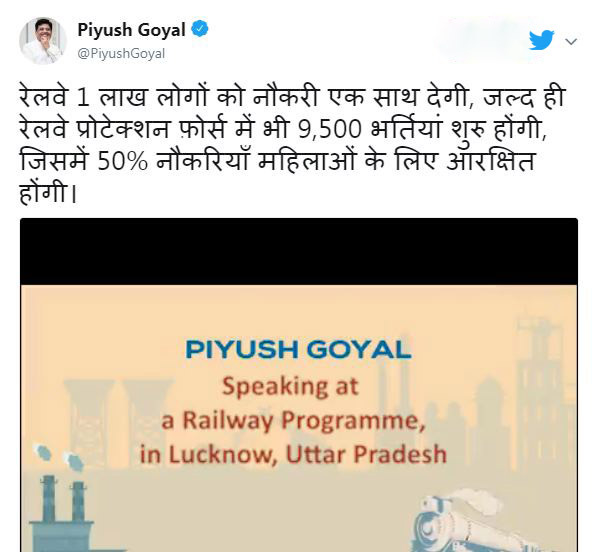 Union Railway Minister Piyush Goyal announced that there is large scale opportunity for the young people of our country. Off course this is a great offer for the aspirants who would like to start the career with Indian Railways. For the year of 2018 RPF recruitment expects to release 9500 Constable (Male and Female) RPF vacancy. All the aspirants can utilize this rare offer that given by RPF Recruitment Board. Grab this offer and move forward to have a successful career. Please check eligibility criteria for RPF Recruitment as follow as below. Note: Union Railway Minister Piyush Goyal stated officially that So Soon we can expect the notification for RPF Recruitment 2018. The Railway Protection Force is shortly denotes that RPF. RPF is also one of the security forces of India. RPF set up framed to protect the railway passengers, passenger area and railway property of the Indian Railways. The RPF has a capability to arrest, investigate and prosecute criminals. The Railway Protection force is comes under the supremacy of Union Railway Ministry of India. According to the Railway Minister Statement that RPF Recruitment board going to conduct recruitment drive for 9500 Constable RPF Vacancy. Hopefully it will reduce the number of unemployed candidates of India. Off course, it is a great announcement bookmark this page for furthermore updates. Applicant of RPF recruitment should be a citizen of India. And the applicant should have passed Matriculation or any Equivalent education also will be applicable to apply for the above mentioned RPF Recruitment. The applicant should have the age between 18 to 24 Years to apply for RPF Recruitment. Age relaxation is applicable for the candidates who are ready to apply for RPF Recruitment 2018. The age relaxation will be according to the Government norms. Candidates who belongs to General category should pay Rs. 40/- as an application fee. Other category individuals from SC/ST/PWD/OBC should not pay for their application. The payment of application fee will be done by online mode. RPF Recruitment application form has integrated with online application form. So the candidate using their Debit Card, Credit Card, Net Banking, etc can pay their application fee. Payment must be from any recognized bank of India. According to the Railway Minister Statement the candidates should have following Physical Stands to qualify the examination. Details as follows below. Followed by the written test the candidates should face PET test . PET Test categorized as three events namely, 1600mts/800mts run, High Jump and Long Jump. The applicant should qualify these three events to Clear RPF recruitment. Detailed description about the events is given below. The Aspirants who qualified of all the above examination they should have to clear medical test. Medical Test will be done by the medical examiner of Railway Hospital. The candidates must clear medical category ‘B-1’ as per the Indian Railway Medical Manual. The candidates who are wearing glasses or having flat foot, knock-knee, squint eye, color blindness and other bodily defects are not eligible to get appointment. The aspirants are expected to file your application only by online mode. For the online application you should visit the official Web portal for RPF Recruitment 2018 at rpfonlinereg.co.in. At the time of filing your application the candidates should ensure the eligibility criteria comparing with the official notification of RPF Recruitment. Follow the instruction of application and fill up online forum with all requisites. Fill up the form without any error and upload all the required documents. Followed by the application process the candidates should pay their application fee that integrated with the online application form. To help you we have provided the simplified the step to apply for RPF Recruitment Application Form. Try to make online payment which is integrated application and submit the application of RPF Recruitment. RPF Recruitment 2018 Notification yet to release and it expected on April 2018. So the candidates stay connected with us for more updates and changes from RPF Recruitment Board.